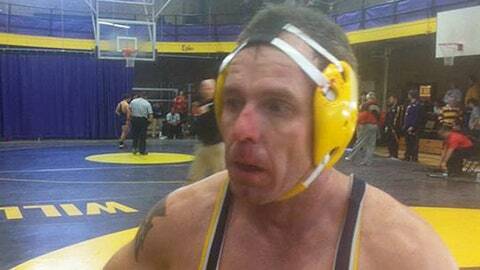 After a career as a firefighter, Rick Chipman went back to his first love -- wrestling. Rick Chipman is a scholar All-American wrestler at the University of Southern Maine, so it’s no surprise he was named co-captain of the Huskies his senior year. What’s unique about Chipman, though, is that he’s 44 years old — and a grandfather. Last weekend, Chipman finished his four-year collegiate wrestling career at the NCAA Division III Northeast regional tournament. Wrestling with a fractured rib and at 174 pounds — two classes above his weight to make room for a teammate at 157 — Chipman lost on opening day, according to the Wall Street Journal. Chipman finished his collegiate career with a record of 32-46 and no postseason wins. Chipman was a high school wrestler in a small town in Maine, nearly winning the state championship twice. He had dreams of wrestling in the Olympics, but Chipman’s high school coach advised him to try wrestling in college first. Life happened to Chipman, as it often does, and circumstances forced him to drop out of college in his first year and start a career as an insurance salesman, and eventually a firefighter and paramedic. Chipman had always wondered how good he could have been had he wrestled in college, and at age 40, he enrolled at Southern Maine to prepare for his life after firefighting. Because of the NCAA’s rules on eligibility, he also got the chance to wrestle again. He wanted it so bad that he added wrestling to a full course load, 42 hours a week as a firefighter and one full-day weekly shift as a paramedic. Despite a less-than-stellar freshman season in which he was "ostracized by his teammates, ridiculed by his son (a fellow student on campus) and clobbered by opponents," Chipman persisted and will graduate from the university this spring.